Items listed below are for information only. No endorsement is expressed or implied. Vendors are listed for your convienence. Stock may be limited and prices vary, shop carefully. Lumivision has a limited supply of these LaserDiscs at a great price. Original Cast of The Addams Family and The Munsters. Behind the scenes interviews and episodes. Gomez is the head of the family and is dressed in pinstriped trousers, purple brocade vest and purple velvet smoking jacket, he holds a cigar. 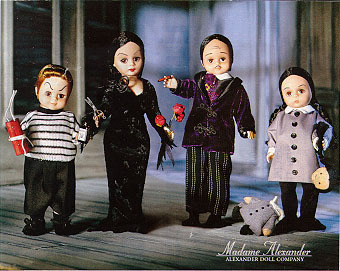 Morticia is dressed in her trademark black velvet dress, she holds roses and a pair of scissors. Wednesday wears a gray cotton school dress and holds Marie Antoinette in a matching outfit. Pugsley wears a striped knit shirt and black pants, he holds a bottle of Arsenic and bundle of dynamite. Made in the USA by Madam Alexander. Gomez and Morticia are 10" tall. Pugsley and Wednesday are 8" tall. All dolls feature movable arms and legs. These dolls are available from Lillian Vernon Catalog, 1-800-285-5555. "TV Sets" is a collection of original blueprints of fictional homes from our favorite programs of the '50s, '60s and '70s. These dwellings have been drawn by artist Mark Bennett. Mark has included details which are the result of 25 years -- and thousands of hours -- of television viewing. Blueprints include The Addams Family Mansion, Darrin and Samantha Stephen's Dutch Colonial to the Flintstones stone abode, from Felix and Oscar's pre-war apartment to the Jetsons' space unit. Novelization of Addams Family Values movie. 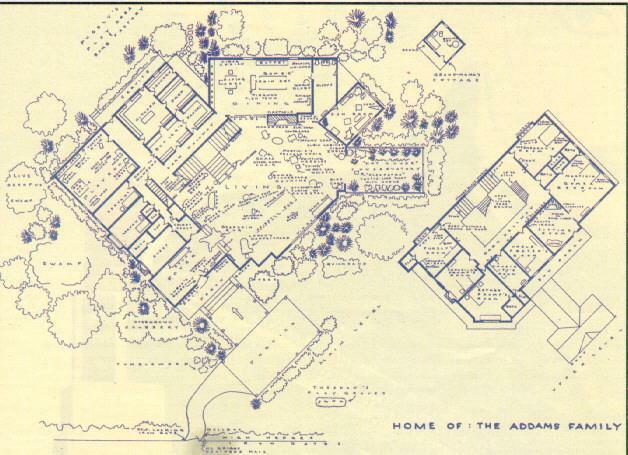 Unofficial Floor Plan of the Addams house. Size 24"x36" $25.00 each + $ 5.00 shipping & handling. Shipped rolled. 6. Addams Family Values cardboard masks advertising for upcoming release of the movie's premiere, have Lurch, Grandma, little boy, and little girl, all mint unused, neat $15.00 each. 7. Addams Family Values, advance movie poster for the release of the movie in theatres, these are about 22in x 28 in. in size, mint. $20.00 each. No claims of authenticity, value, mercantibility or condition are made by AddamsFamily.Com. All items are sold by the individual(s), or companies. No warranty is expressed or implied. 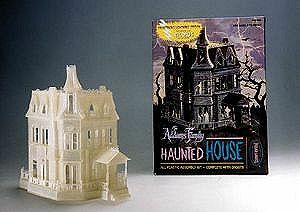 These listings of collectables are offered only as a public service by AddamsFamily.Com. Any fraudulent items will be removed from these pages. Copyright © 1998, Jon A. Davis. All rights reserved.